They called themselves the Red Skin Kingz, or RSK for short. 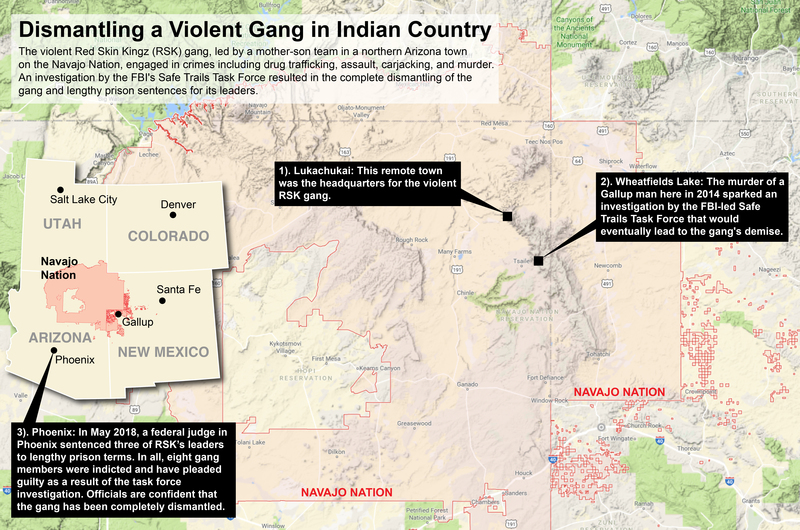 And unlike most gangs on the sprawling Navajo Nation Indian Reservation that occupies portions of Utah, New Mexico, and Arizona, this criminal group was highly organized and extremely violent. In May 2018, a federal judge in Phoenix sentenced 28-year-old Devan Leonard to 50 years in prison. His mother, Lucille Leonard, was given a 10-year sentence, and a third gang leader, 26-year-old Kyle Gray, received a 30-year prison term. In a rare occurrence, the three were charged with racketeering offenses typically reserved for the Mafia and other highly structured criminal groups. The Racketeer Influenced and Corrupt Organizations (RICO) Act is a federal statute that provides penalties for actions performed as part of an ongoing criminal organization. In this case, RSK had been engaged for years in drug trafficking, carjacking, kidnapping, and murder. RSK members primarily operated in and around the remote northern Arizona town of Lukachukai. Devan Leonard and his mother had a legitimate business there, but selling cocaine and methamphetamine was the gang’s priority. It was a drug-related murder near Gallup in 2014 that triggered the investigation that eventually brought the gang down. On December 16, 2014, Gray and Devan Leonard shot and killed a Gallup man after a drug deal in nearby Wheatfields Lake, Arizona. Then they took the victim to a remote camp on the Navajo Nation, where they dismembered and burned the body—and forced the victim’s girlfriend to watch. Investigation by the FBI-led Safe Trails Task Force—which consists of local, state, federal, and tribal authorities, including the Arizona Department of Public Safety and the Navajo Nation Department of Public Safety—led to Devan Leonard and Gray, who were indicted for the murder in 2015. Many of those crimes went largely unreported because they occurred in and around Lukachukai, an area so remote from law enforcement that community members who had witnessed RSK’s criminal activity were afraid to come forward for fear of reprisals from the gang. “This community was being held hostage,” Caputo said. After Devan Leonard and Gray were indicted for the Wheatfields Lake murder, however, and task force members conducted hundreds of interviews in the area, residents gained trust in law enforcement and began to cooperate. Devan Leonard was eventually linked to two other homicides that occurred four days before the Wheatfields Lake murder. Evidence revealed that Leonard and another RSK leader shot and killed two men and transported their bodies to a remote area in Lukachukai, where they were dismembered, burned, and buried. According to court documents, Lucille Leonard did not take part in the violence, but did hold a leadership role in RSK, mostly overseeing drug trafficking and the collection of debts owed to the gang.